Earlier this year, the president of the Harrisburg Camera Club was looking for suggestions for photo field trips. Before I could think, I opened my mouth and said that Annette and I had always wanted to spend some time at the Anderson Grist Mill. He took that innocent comment to mean that I was volunteering to arrange for the photo shoot. So, I did. 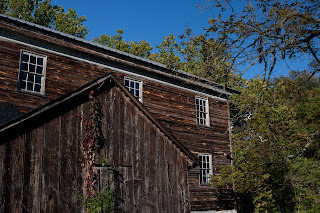 On October 9, 2011, Annette and I hosted the Harrisburg Camera Club at the Anderson Grist Mill. Everyone seemed genuinely excited to see all of the fascinating, old-fashioned items in the mill. There were so many things. There were so many textures, shadows and patterns. Because of the way the mill is squeezed between the creek and the road, it was difficult to get an overall view of the mill. So we concentrated on getting details. Here are a few detail shots of mine. 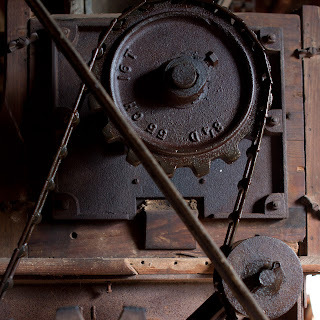 I don’t know the name of the machine that these gears were part of, but the vertical shaft going out of the top of the picture turned an eccentric wheel that shook the ground grain. I assume it was some sort of sifter. I played around in this room for quite a while. I wanted to get the exposure such that I could see the scenery outside and the inside would look like it was lit by the window. It was easier said than done. First the window exposure had to be right. The amount of light coming through the window can’t be changed, so I dealt with it first. 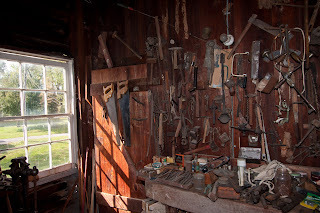 Then light had to be added to the wall of tools. That was tricky. First I experimented with on-camera flash at various output levels and pointed in various directions. Then I tried off-camera flash at various levels. I even tried a reflector to reflect sunlight from the window behind the camera on to the tools. This is fascinating to me. 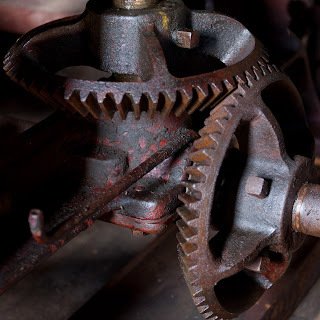 Wooden gear teeth! How did they carry the load? Why didn’t they break? 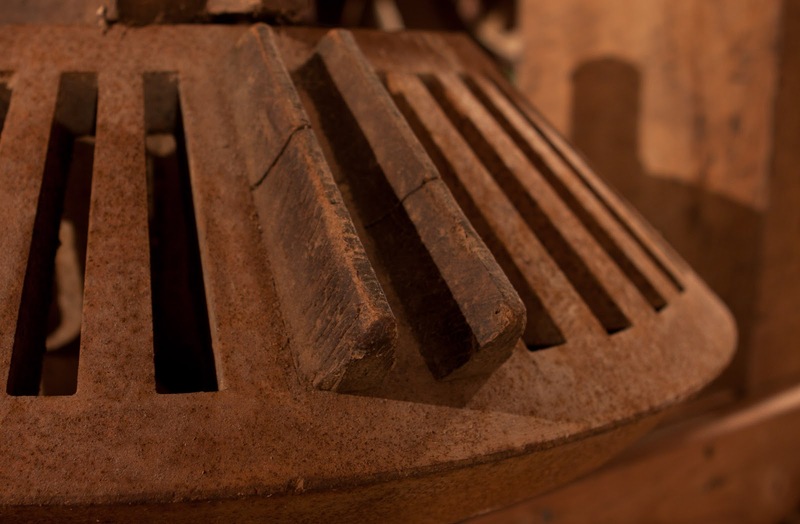 Wooden gear teeth are much quieter. Wooden gear teeth can be replaced relatively easily. Another thing that truly fascinated me was the ingenuity that went in to the design of the building and the workings of the mill. I assume that the men were faced with a lack of money, lack of steel components but were blessed with an abundance of wood. All of the chutes and ladders and walls and structure of the mill were made from wood. 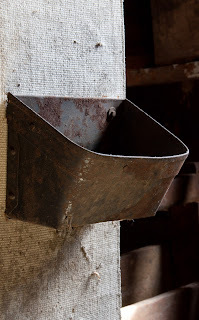 There were some steel or iron components, but they were only used where they had to be used. I believe that each mill is unique. Sure, the designer/builder could visit other mills to see how they were built, but each mill site has its own set of constraints. The designer/builder would have to use his experience and intelligence to make the new mill the best it could be at the new site. This is much like photography. The photographer must use his experience, what he has observed in other photographs and his intelligence to make an image that is new and is the best it can be.